The Chillicothe Rotary Club and Lions Club have teamed up to offer the public a chance to view bald eagles on the Illinois River while feasting on an all-you-can-eat pancake and sausage breakfast. Chillicothe’s annual Bald Eagle Celebration takes place from 7:30 to 10:30 a.m. Saturday, Feb. 9, at the Shore Acres Clubhouse, 100 Park Blvd., which overlooks the Illinois River. Tickets are $7 for adults and $3 for kids 10 and under. Rotary Club members will man the grill, while the Lions Club is arranging for a storyteller, nature author and birds-of-prey demonstration by Wildlife Prairie Park. The event will also feature an art and photography contest. The Audubon Society will be on hand with eagle facts and binoculars and spotting scopes for prime eagle viewing. “Kids especially love it when they can see an eagle up close through the binoculars,” Denekas added. Illinois hosts more wintering American bald eagles than any other state outside Alaska, according to the Illinois government website www2illinois.gov. The website states that more than 3,100 bald eagles can be viewed in their natural habitat throughout the state each winter, with January and February being the optimal time to see the majestic protected birds. Chillicothe’s eagle celebration is just one of many special eagle-watching events held around the state each winter. Another event is set for Feb. 16 at Henry, which is about 16 miles up the river from Chillicothe. That annual bald eagle celebration runs from 7 a.m. to 12:30 p.m. at the Henry American. Bald eagles have been found wintering throughout Illinois at various locations, including all along the Illinois River; at the Illinois and Michigan Canal and Chicago Sanitary and Ship Canal in northeast Illinois; along the Des Plaines River near Channahon State Park in Channahon; and on the Fox River at the Pleasant Valley Forest Preserve in Woodstock. In the Peoria area, eagles can often be spotted near the Peoria Lock and Dam along Wesley Road, along the river near the RiverPlex in Downtown Peoria and just south of the McClugage Bridge. The Chillicothe event will feature storyteller Rose Staley and local photographer David Zalaznik, who will discuss his book of photographs titled “Life Along the Illinois River.” Wildlife Prairie Park staff will bring eagles and other raptors to the event. The Chillicothe Optimist Club will announce the winners of its annual photography and art contest during the celebration. Entries will be on display at the Chillicothe Public Library in February. 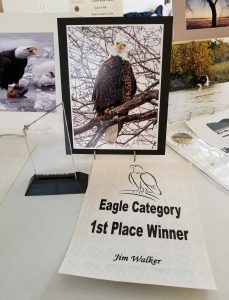 Peorian Jim Walker is looking forward to attending this year’s event after taking first place in the eagle category of the photography contest last year with a photo of a cross-eyed eagle that he took behind the East Peoria Steak-n-Shake during his lunch hour. The eagle celebration is a fundraiser for both the Rotary and Lions clubs. Denekas said funds raised go to a variety of projects, including an event to honor National Merit Scholarship winners and to provide support for a student exchange program between the IVC school district and Germany. The Rotary Club is also helping to raising funds through other events to replace an eagle statue that was carved in 2010 by local artist Tim Gill. Carved from the 13-foot stump of a downed cottonwood tree, the statue has deteriorated beyond repair, Denekas said. It’s located at Eagles Landing near the boat ramp down the river from Shore Acres. Denekas said the club has been unable to reach Gill so an artist in Iowa has been hired to carve a new eagle statue similar to the first one. “He’s looking for a piece of wood to make it the same size as the original. We’ve already sent him pictures and measurements, and we hope to have it up by the end of the summer,” Denekas said, estimating the sculpture will cost about $800, plus the cost of transporting it here. The pancake breakfast eagle celebration will take place in virtually any kind of weather. “Last year we had a pretty good snowstorm, but they had it all cleared and plowed, so we’ll try to have it no matter what the weather does,” Denekas noted. “I don’t think we’ve ever had this event where we didn’t see any eagles. Last year or the year before, there was one right outside the clubhouse in a tree. That was very exciting,” she added. Tickets can be purchased at the door or in advance from any Rotary Club or Lions Club member. Tickets are also available at Happy Thought Coffee, 953 N. Second St. in Chillicothe.